Richly illustrated with first-person accounts from trauma survivors, this book encompasses theories, diagnosis, and treatment as well as how trauma affects family members and caregivers. 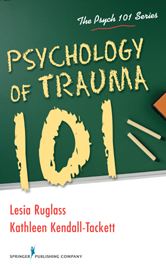 It also addresses the variables of gender, race/ethnicity, and culture as they bear on trauma psychology and the potential health consequences of trauma. In addition, the book illuminates controversies in the field and such emerging topics as posttraumatic growth, multiple traumas, and how traumatic events affect communities. Chapter 1 What Is Psychological Trauma? Chapter 2 How Do You Diagnose Posttraumatic Stress Disorder?